Next on the positivity scale comes persuasion for a shift in perspective. Few people are willing to readily abandon strong beliefs or opinions. As human beings, we often take some convincing. On the positive side, this requires that we develop a way to compare and contrast one perspective with another. In the 1980’s, many office workers resisted moving from electric typewriters to word processors. Even thought the keyboard was the same old Qwerty, this significant paradigm shift caused many to balk — the devil they knew was better than the devil they didn’t. The immediate response to resistance was a very effective campaign to show all the benefits, advantages, special features, cost savings, etc., that the new technology offered over the other (including a reduction of paper… oh, well). As benefits overwhelmingly mounted to offset costs, and gains shadowed losses, more and more people made the shift. Try today to find a typewriter ribbon, cartridge, or IBM Selectric print ball. The shadow side of persuasion moves us to heated debate, where an emphasis on the positive of the one idea shifts to a focus on the negative of the other idea. Here, what is wrong with your thinking is more important than staying on message with what is good about my perspective. This occurs when the evidence in support of one perspective is not as strong as the flaws and faults in another perspective. For the past forty years, this form of disagreeing has framed the abortion conversation. “Pro-life” and “pro-choice” have spent much less time presenting what is “pro-” about their own position. Instead, they invest great time, energy and resources in attempts to undermine the message of the opposition. Criticism masked as critique and contempt masked as concern all but guarantee that there will be little resolution or compromise in the conversation. The Gay/Lesbian/Bi-sexual/Transgender/Queer (Questioning)/Intersexual (GLBTQI) conversation stands on the border between the third and fourth forms of disagreement. In the fourth quadrant, debate shifts to disrespect as civility breaks down and we resort to attack. Attack means that I will not only disagree with your perspective, but I will also impugn your character, your intelligence, your upbringing and parentage, your competence, and your ethics. This is where the gloves come off and we resort to any and all devices to make our opponent look bad. We don’t simply want to win, we want to hurt those who disagree with us. We are vicious. Of course, we act as if we are innocent and always and everywhere pretend we take the high road. Unfortunately, folks who fight dirty are fooling themselves. The pettiness, immaturity and injustice of personal attack is transparent and obvious. This is one of the main reasons people give for leaving organized religion — they see “good Christians” engage in hostile, hateful, degrading attack (in the name of Jesus the Christ…). I am reading Daniel Dennett’s, Darwin’s Dangerous Idea, and it is a fascinating blend of the four types of argument, and it illustrates the power of each quadrant of the matrix. As with his other writings, when he posits a theory or concept and builds a positive, constructive argument for it, he borders on the brilliant. He is reasonable, rational, and convincing. Sometimes, he engages a careful and critical analysis, comparing and contrasting one perspective against another. Once again he is strong. But then he slips. The moment he allows himself to shift from the positive to the negative he becomes(in my opinion) shrill and pedantic. He quotes himself as evidence (citing his own earlier works as support for his own perspectives — a necessary practice for people who can’t find others who agree with them…) and his argument loses its rational, reasonable edge. He becomes obsessed with disproving the opponents instead of proving his own perspective. On certain issues, he completes the slide by calling (or insinuating that) those who disagree with his thesis are simple, ignorant, uninformed, backward, stupid and irrational. He allows only his way of thinking as allowable or acceptable. He provides the foundation upon which Richard Dawkins and others who attack religious faith build. Dawkins is another excellent illustration of the four types of argument and disagreement. His writing that posits a thesis then builds support are brilliant; his attack books are poorly reasoned and constructed. The whole point of this is to say we have a choice in how we will disagree with each other. Disagreement is not the problem — it is difficult to grow, learn, progress and evolve without disagreement. But how we disagree is critical. 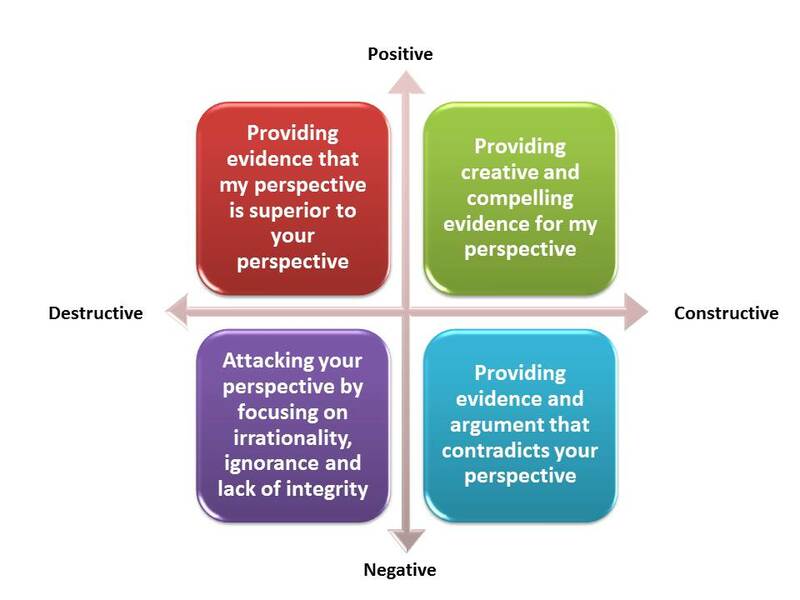 If we can commit to engage differences of thinking in the top two quadrants, we will get a whole lot farther than opting to stay mired in the lower two quadrants. Generally, only those who have little confidence in their position need to resort to the lower two approaches. With the conviction of the strength of our thinking comes the ability to stay focused in the positive. Those who feel assurance in their thinking are not threatened by those who disagree. It is only the uncertain and the unconvinced who attack the thinking of others. I recently experienced a “Fourth Quarter” attack when I posted on a FB clergy page about an opportunity I had as keynote speaker at a Democratic Fund Raiser dinner in my area. I was so honored to be able to bring a voice of clear Christian grace to the public sphere, especially in a world where clergy have lost their voices as moral compasses in the community, Several comments from fellow clergy when I posted some reflections on it were simply vicious. I was not surprised–that is the tone of many FB conversations. But I was saddened. We will not even support our own. http://christythomas.com/2014/02/24/praying-for-ted-nugent/. The unfortunate reality is that both politics and religion are engaging at the lowest levels instead of the highest. It has become our cultural default setting to attack the person who differs. My dismay comes from the sense that so many people are okay with this. I believe as Christians we should commit to the highest, most rigorous standards for interpersonal relationships. When some positions cause harm to other people, it seems unacceptable to avoid discussing that. From my perspective, for instance, any discrimination against LGBT people is not only morally wrong but also anti-Christian and harmful for people on the receiving end. I can’t just focus on saying LGBT people are full human beings without discussing the deep, abiding pain caused by those who treat them as less than made in God’s image. From a different perspective than mine, those who believe that fetuses are full human lives, on the other hand, can’t possibly ignore that they believe people like me are totally fine with killing babies. If one genuinely believes that abortion equates to murder, one can’t focus on the joys of adoption and supporting pregnant women without at least acknowledging that oh, by the way, people who don’t believe this way are murderers. I think what I’m pointing to is that for some disagreements, the stakes are too high to limit discussion to advocacy and persuasion without acknowledging the need for some debate and defense of the minority–and to some people, a robust defense looks and feels like an attack. The question regarding schism is a question of how much we agree on the deepest principles–the fundamentals of the faith. And to be honest, there are folks in the church whose God is not only unrecognizable to me but who actively looks evil by all the metrics I know to use. I know from conversations that the reverse is true, too. If we not only don’t agree on who God is but also have diametrically opposed understandings of Jesus, then why *should* we remain together? What a marvelous example of the entire point of the post, Shannon. Thanks. Well, that’s one way to avoid substantive engagement with it. Amazing insights and solid illustrations. An interesting (if now dated) read that touches on this subject is Deborah Tannen’s book The Argument Culture.